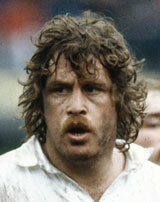 John Scott played for England between 1978 and 1984, and was in their 1980 Grand Slam side. While the bulk (31) of his caps came at No. 8, he also made three appearances as a lock . In 1984 he took over the captaincy of a side in transition but it was not a successful time and he lost all four matches including two in South Africa. That was a far from happy tour and Scott in particular came in for media criticism, signalling the end of his international career. At club level he was a great success, captaining Cardiff to three successive Welsh Cups and being in a side that won five in six seasons between 1981 and 1987.